We joked as we were setting up that we felt like we were on an HGTV party special, only getting about 15 minutes to setup and get ready. I think we did a pretty good job! Favors were cute puzzles found at the Dollar tree. 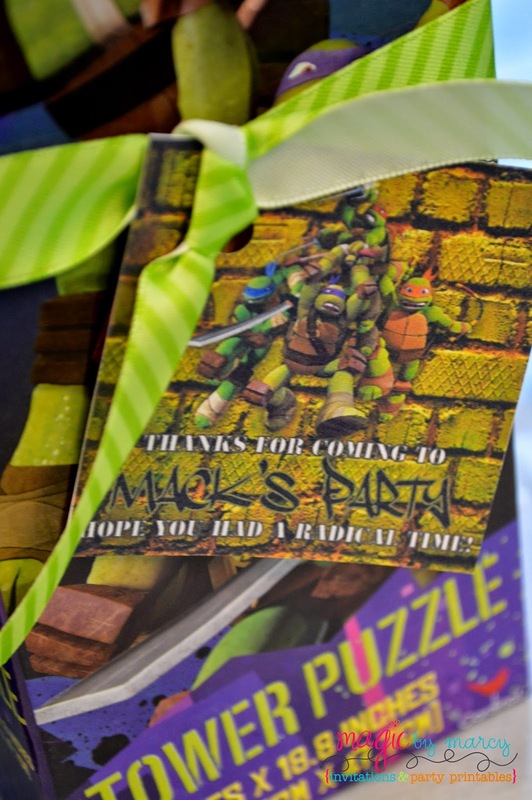 Adorned with some ribbon and a cute custom tag from the TMNT kit found at Magic by Marcy To go with the whole TMNT theme Amanda used regular household items in creative ways. 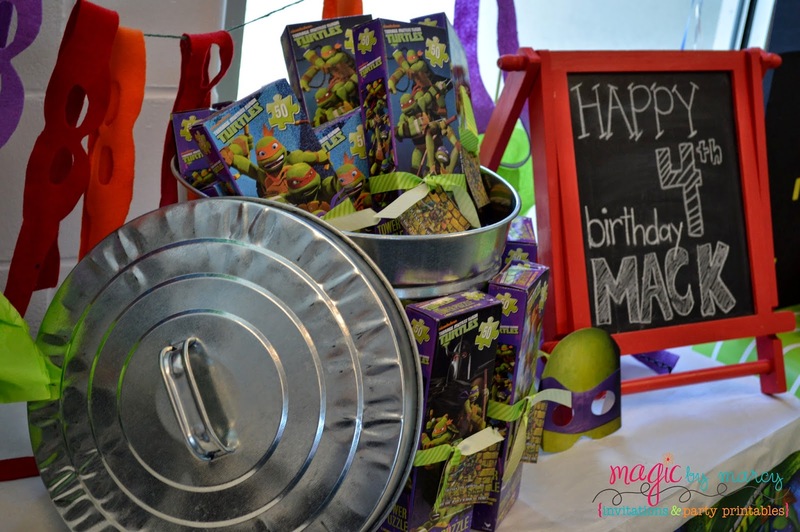 a metal trash can held the favors, and tine cans served as the base for the clothesline that held the kid's masks. The boys were all thrilled to bounce around the gym in their Ninja Turtle masks. She creatively cut them from felt, super easy for the kids to tie on and go! The backdrop was made from science boards and construction paper, a night time cityscape helped transform the multipurpose room at the gymnastics center. 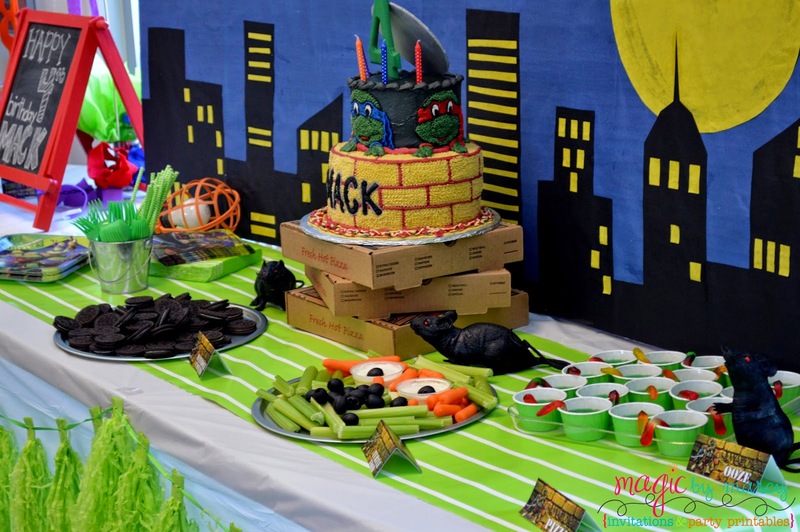 Pizza boxes were used as the cake stand and a one of a kind cake was created by our friend and go to cake lady Marilyn. Her tasty cakes are always a show stopper! She takes the invitation and creates a cake to match. She is simply the best! 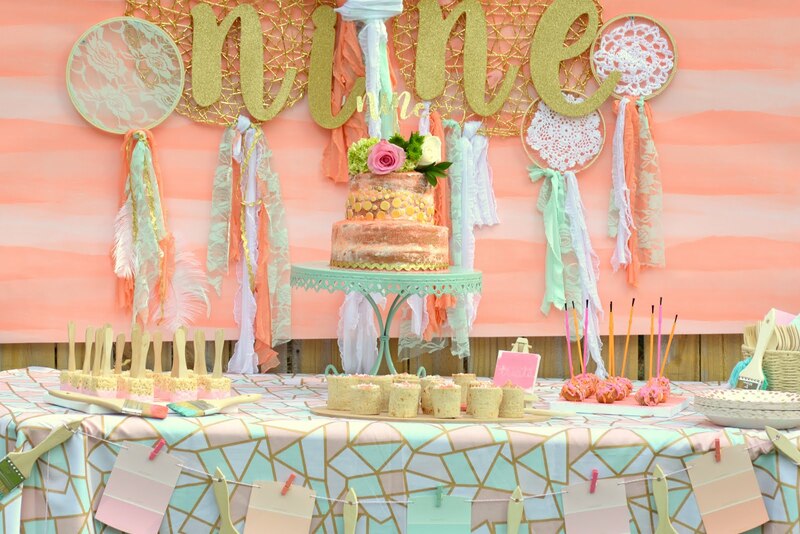 One of my favorite time & money saver tips use brightly colored wrapping paper as a table runner, it dresses up the table provides a punch of color, stores easy when packing for an away party and you just throw it away when you are done. I designed Custom Food tent cards for the occasion. 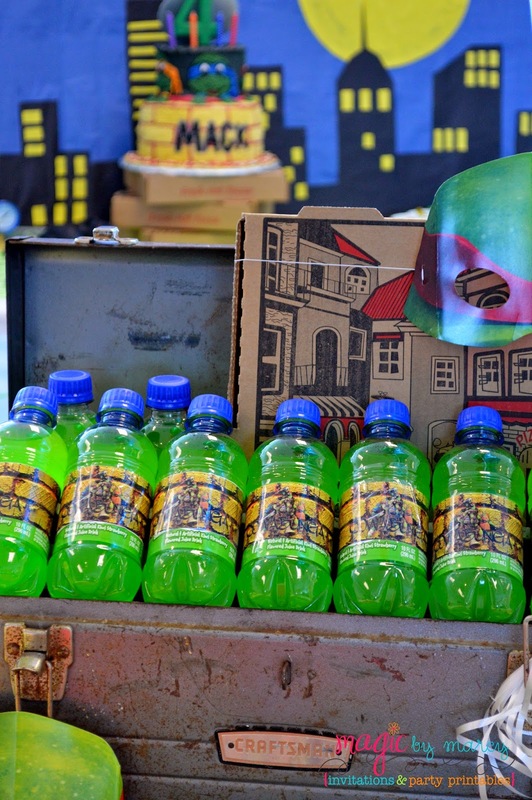 Amanda had to get creative with some TMNT approved goodies. 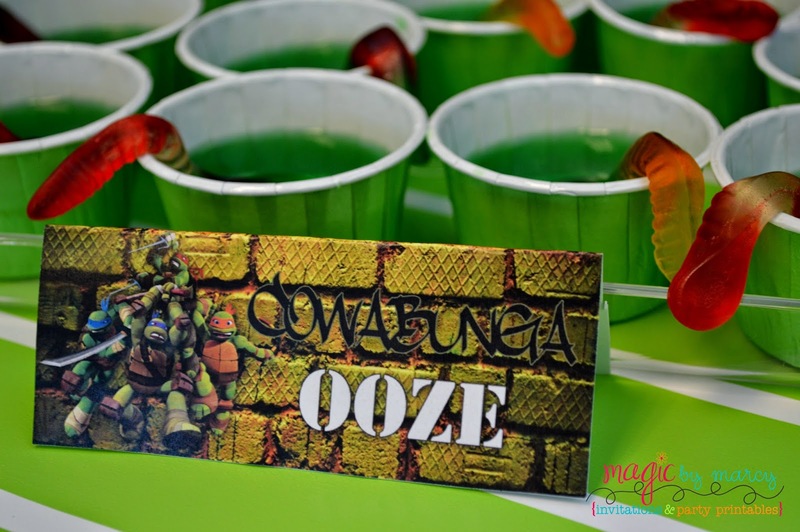 Ooze was green jello with some slimy gummy worms. Just love those cute paper cups! 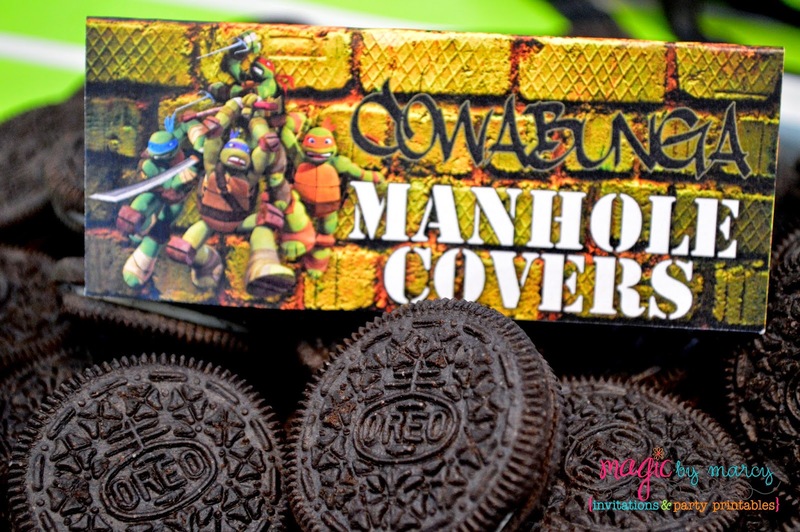 Oreos were a perfect choice for some sewer manhole covers. 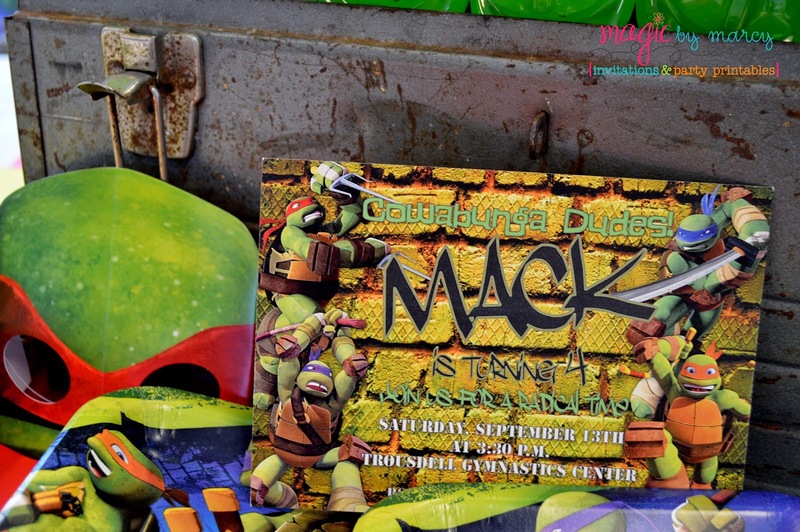 The invitations helped set the tone for the day, all 4 of Mack's favorites were on the invite. Of course he can name them all....not sure if Amanda and I can! 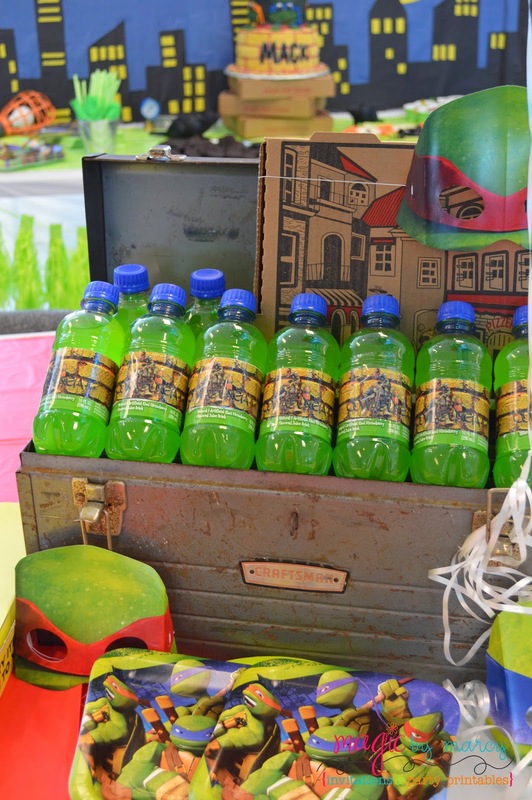 Green Hawaiian Punch is a perfect choice for this theme! 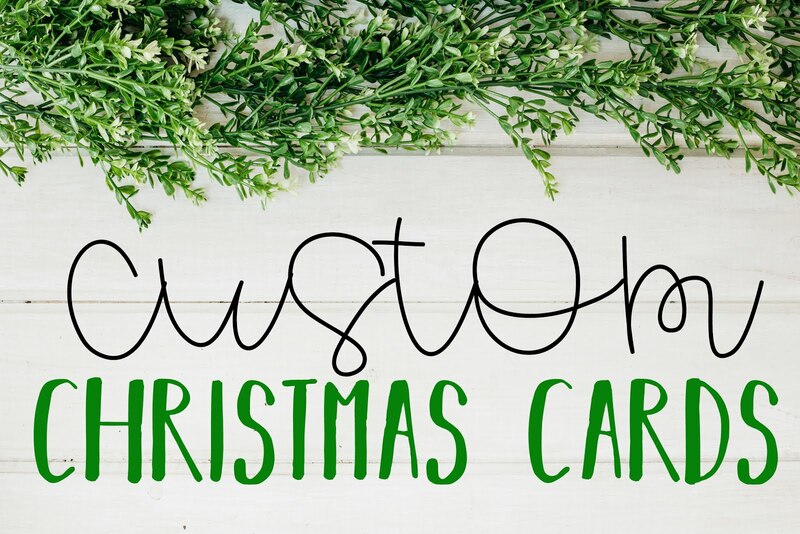 Wrap it with a custom water bottle label and add some clear packing tape to create a waterproof label. 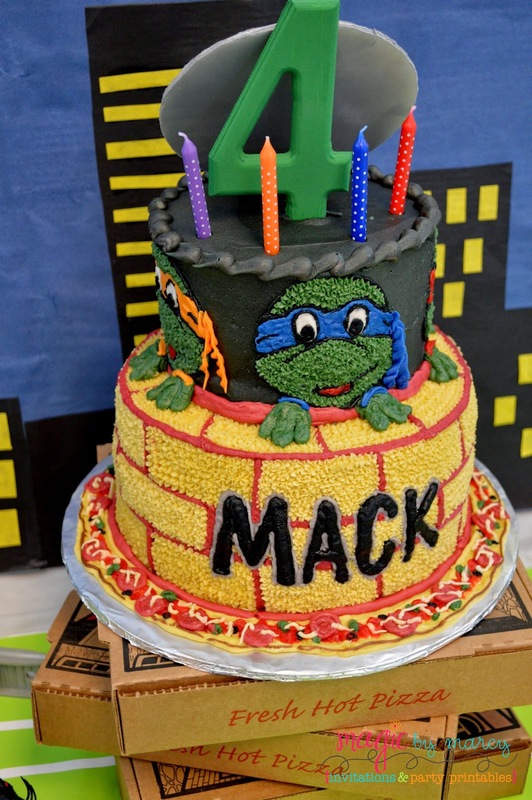 Everything was just perfect for Mack's Big Day! is there any way to purchase the food tents? I hosted corporate events here and it is a fantastic venue. The food, service and mostly the staff were truly amazing. Though we had to sort some bill issues which were about to put a damper on my magical day! 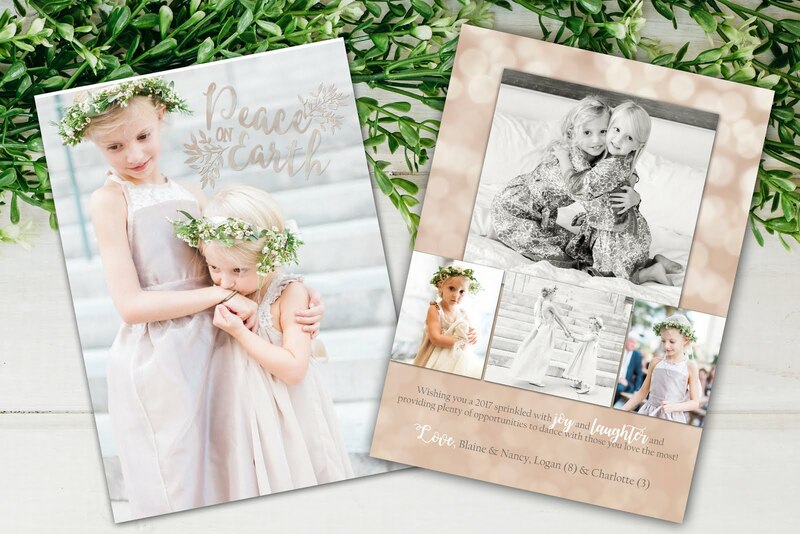 Purple Turtle is an ace creator of children's books and has created a name for itself in the international market with its innovative and creative approach to designing children's books.